Before van Gogh, Mondrian, Escher, and de Kooning; before Vermeer, Hals and Steen; and yes, even before Rembrandt, was Pieter Bruegel the Elder (1525– 1569), the leading Netherlands painter and draftsman for over 100 years. In honor of the 450th anniversary of his death, the Vienna Kunsthistorisches Museum (considered the “greatest treasury of Bruegel works world-wide”) ran a massive four-month-long exhibition. Bruegel: The Master is the catalog that documents the exhibition and details recent scholarly research and analysis. For better or for worse, the publication is offered in two formats. The physical book, which is reviewed here, contains only an introduction to the exhibition and the collection of artworks: 150 illustrations including 87 exhibition plates. The remainder of the catalog is in e-book format and only available in a downloadable format from the Kunsthistorisches Museum website using a code that is found in the hardcopy book. While having the spectacular reproductions and their associated commentaries in hand is extremely valuable, the meat of the scholarship is in the ebook. Five important essays remain out of reach for those not able to read on a screen. The jury is still out on the efficacy of this type of publication but from this reviewer’s point of view, this knowledge in printed format is sorely missed. In any case, what is included in the physical book is outstanding and exciting, a true art-historian’s page-turner. The 12 panel paintings in the Vienna collection have been thoroughly examined, technically evaluated using UV-light, infrared reflectography, macro-photography, and X-radiography. Findings from these investigations have led to revisions in previous assumptions and provenance attributions. Examples are included in abundance. The Battle between Carnival and Lent (1559), is one case in point. The description includes: location and date of Bruegel’s signature, the medium and size of the painting; location and inventory number in the museum, the likely provenance history from Rudolf II in 1604 to Archduke Maximilian III in 1619 to Archduke Karl in 1626 to the Vienna Picture Gallery in 1748, and various scholarly references. The four authors take turns writing descriptions throughout the book and for The Battle between Carnival and Lent Pènot and Oberthaler have made the contribution. They discuss the Wimmelbild (‘busy picture’) format and describe the context behind the theme of the battle, noting some of the important iconography that would have been recognizable to a contemporary audience. With this basis set, the technical nitty gritty begins. Several sections of the painting are set side by side to compare the painting from (a) visible light, (b) infrared reflectograms, and (c) X-radiographs. In some cases it is hard to see what the experts are pointing out due to the diminutive size of the printed images, but the impact is still impressive. Seeing the underdrawings beneath the paint reveals Bruegel’s initial technique as well as later “painterly censorship” that occurred over the centuries as tastes and social mores changed. In The Battle between Carnival and Lent begging children, a disfigured cripple, and a bloated corpse were all at one point painted out of the scene. 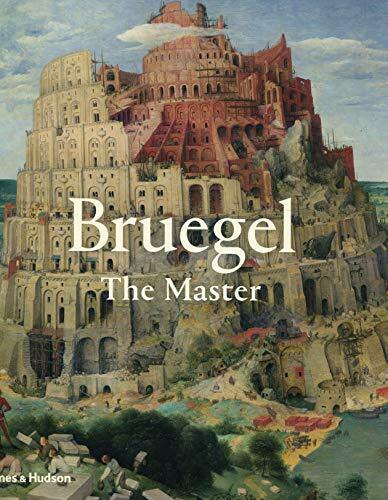 In short, there really is nothing that is not captivating about Bruegel and Bruegel: The Master has done all it can to present an extraordinary, comprehensive, savvy and scholarly survey of the life and work of this enduring painter, the dynasty he created, and the legacy he left behind.